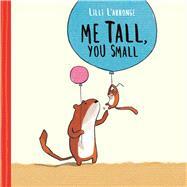 Me Tall, You Small is a series of playful vignettes in the daily life of a pair of weasels, parent and child. Whether they are having a bubble bath, kicking a soccer ball, or eating ice cream together, simple paired phrases showcase their lovingand amusingly realisticrelationship. After a fall: You boo-boo. Me bandage. At bedtime: Me tired. You wired. Lilli L'Arronge writes and illustrates books for children and adults. Her work has been translated into French, Italian, Portuguese and English. In her spare time, Lilli does animation work for film and television. She lives in Münster, Germany.